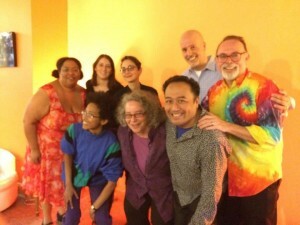 Beltway Poetry Reading at Coffy Cafe, May 2016. From left to right: Tolonda Henderson, Riley Ramanathan, Megan Alpert, Tanya Paperny, Kim Roberts, Regie Cabico, Noah Stetzer, Peter Montgomery. Beltway Poetry Quarterly is an award-winning online literary journal and resource bank that showcases the literary community in Washington, DC and the surrounding Mid-Atlantic region. As the only journal in the region to focus solely on DC and surrounding jurisdictions, we are able to document a literary community in depth. Since our founding in January 2000, we have showcased the richness and diversity of Washington area authors in every issue, with poets from different backgrounds, races, ethnicities, ages, and sexual orientations represented. We have included Pulitzer Prize winners and those who have never previously published. We have published academic, spoken word, and experimental authors—and also those poets whose work defies categorization. Co-editors Kim Roberts, Margaret Corum, and Venus Thrash usually curate two or three issues a year. One issue is a themed issue with an open call for entries, and one issue is a Portfolio, with a longer selection of work than other journals provide (usually four to eight poems by between four and seven authors). Once a year, we invite a guest editor (an area writer who has previously been featured in a Porfolio issue) to create an issue. Repeating special issues include literary history issues (honoring the legacy of poets who once resided in DC) and our popular First Books issues. Other special issues are arranged around themes that reflect aspects of life in Washington, DC: politics, famous former residents, museums and monuments, and neighborhoods. We have also had issues devoted to traditional forms (including the Sonnet Issue and the Prose Poem Issue). 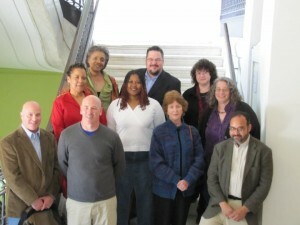 The Resource Bank offers extensive links for poets and their audiences in the Mid-Atlantic. Links include reading series, literary presses, grant-making organizations, workshops, libraries, and other relevant information. Our only non-regional listing is the massive international list of Artist Residency Programs, and we believe ours in the most complete listing of this kind to be found anywhere in the world. With programs across the US and in other countries, these links can help artists of all disciplines find a place away from home to create new work.